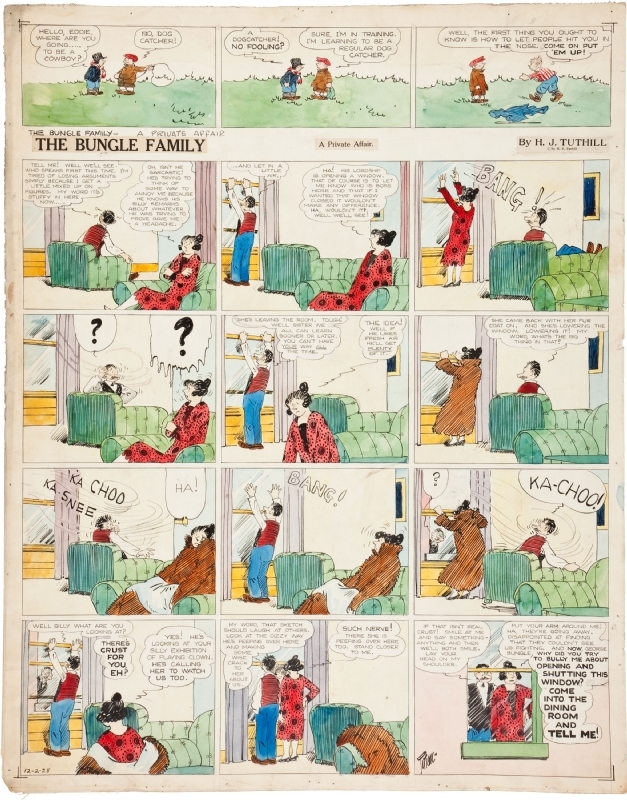 Last week, someone mentioned the old Bungles comic strip by Harry J. Tuthill. I had heard of the Bungles, but knew little about them and nothing about Tuthill himself. So I started with a quick Wikipedia search. Tuthill was something of an unlikely cartoonist, seemingly not doing anything related to drawing or illustration until his 30s. But he launched Home Sweet Home in 1918, which he retitled The Bungle Family in 1924. He finally retired in 1945, and passed away in 1957. 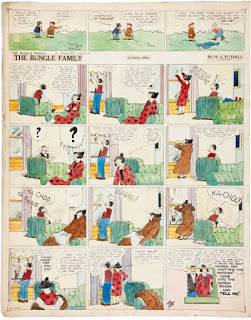 Tuthill continued to draw The Bungle Family for McNaught [Syndicate] until he had a dispute with the syndicate in 1939, which no longer carried the strip in 1942. After a hiatus, the strip returned May 16, 1943, with newspapers running a promotional banner, "The Bungles Are Back!" The final two years were syndicated by Tuthill himself until 1945 when he retired. My first question is: what was this dispute about? I can't find any other references to it online, and what I have in my print library doesn't mention it at all. The Don Markstein Toonopedia page says that Tuthill tried retiring multiple times, so perhaps it was a conflict over that? The notion of ownership would be another obvious candidate, although given that he later returned to the strip without McNaught which suggests that Tuthill was able to hold on to the copyright, so maybe that was never in contention. But that's the other thing that strikes me: Tuthill syndicated the strip himself in the 1940s. That wasn't unheard of, I suppose, but syndicates had been the primary distributors of newspaper comics for at least a couple decades by then. Tuthill certainly would have been aware of, if not made many contacts in the newspaper world by 1943, so that would have helped him. Creators often don't syndicate their own work because it requires a lot of business and social skills that right-brain creators don't often possess in abundance, if at all. I suspect it's much easier now, with so much being run digitally, but back in the mid-1940s, everything would have had to have been done manually. Do-able, but as a ton of additional work besides just creating the strip itself. Not to mention that a lot of newspapers only wanted to deal with one syndicate, rather than worry about and juggle two or more different accounts for comic books. And this is all in 1943 to boot! Does anyone know more of this story that they'd be willing/able to share? This sounds absolutely fascinating! First, I'm a bit leery of the "dispute" between the syndicate and Tuthill. the Maurice Horn edited 100 Years of American Newspaper Comics (1996). circulation of 300 newspapers to around 70 papers when it stopped in 1942. Newsweek says he was "tired". syndication side of the comic strip. of Iwo Jima. Three months after that battlefield death the strip ended. Thanks very much, Degg! Very useful insights!